Your Munich driverguide will pick you up at a location of your choice within Munich or its surroundings and take you to the Dachau concentration camp memorial next to Munich. 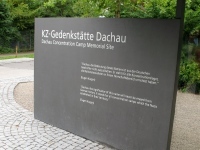 After your arrival, you will undertake a visit to the Dachau concentration camp museum and see a historical documentation film about the Dachau concentration camp during the Third Reich. The English documentation film is shown at the Dachau memorial every day at 11:30 AM, 2:00 PM and 3:30 PM, of course we will adapt the program of our sightseeing excursions to these times to avoid unnecessary waiting time. After the end of your visit to the Dachau concentration camp memorial, your driverguide will take you back to Munich to the meeting point of our guided excursion.